If you’ve been subscribed for a while, there’s one small change this month. Previously, to access the members only pages you had to enter a password. I had a lot of messages from members who found the whole password thing a little annoying. So I’ve added the content that would have gone on the site directly here instead. As always, if you have any comments please don’t hesitate to let me know, I genuinely love hearing from you! My photogenic places of the world section is dedicated to finding the places of the world where the photographic material on offer is so rich, you can’t help but take great photos! This month’s photo is one I took a few years ago in Prague. The photo is of the Old Town Square, dominated by the Church of Our Lady of Týn. Prague is a great place for photographers. The old gothic buildings came through the second world war relatively unscathed. Consequently there’s lots of old architecture to aim your camera at! The only downside to photographing all those old buildings is that we often get what is called “converging verticals”. Because of the angle you have to shoot at, the vertical lines of the buildings tend to lean inwards. In this section – tips and tricks to help you get the most out of Photoshop. Sometimes you might want to distort an image to either correct something, or make a photo more dynamic. 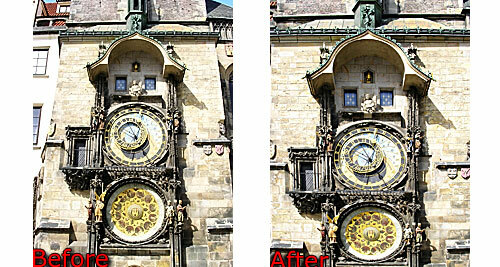 This month I’ve used another photo from Prague to show you how this tool works. There’s a before and after photo below to show you what we’re doing here. The “before” has converging verticals. They’ve been corrected in the “after” photo. So how’s it done? 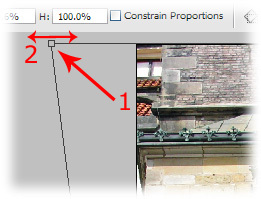 Open your photo in Photoshop, and then go to image then choose transform and then perspective. A bounding box will appear around your photo. Grab one of the corner handles (see arrow 1 below), and then slide it from side to side (arrow 2 below). Your image will distort as you do so. Slide the image until the verticals are, well, vertical again! Although take care – sometimes this makes photos look a little unnatural. It’s often better to adjust the verticals, but don’t make them completely straight. What causes “red eye”, and how to avoid it.